Education is at the heart of everything we do at The New Art Gallery Walsall. We promote the use of visual arts as an educational tool to inspire, excite, and develop skills, knowledge and understanding. We aim to provide an excellent model of accessibility to reach the broadest possible audience. Visiting an art gallery helps pupils with varied learning preferences, develop confidence in themselves and deal with the world around them. 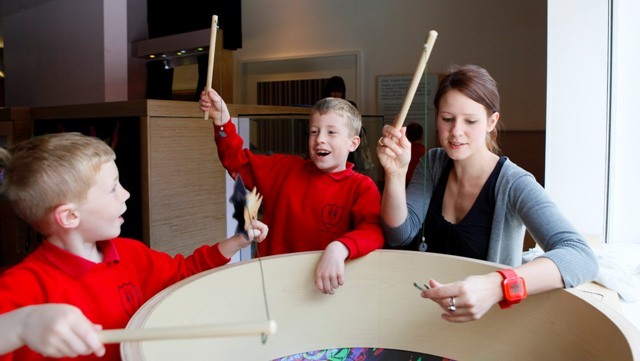 We offer you and your pupils inspiration from world class art displays, providing stimuli for cross curricular learning, developing communication skills, problem solving, critical and contextual studies and creative thinking. Whether you want to make a self guided visit using our resources for group visits or take advantage of our free talks or our paid taught sessions for groups at nursery, primary, secondary or special needs level why not call us and speak to the education team. These sessions are all bookable at your convenience. You and your group are welcome to visit the gallery at any time, Tuesday to Sunday, and admission is free. Please telephone in advance to let us know you are coming, or book a session with gallery staff prior to your visit. There’s more information and help for Organising a Visit to help your planning go smoothly. • We offer specific sessions for teachers to have an introductory tour, discussion or practical session with us. • Do talk to us to see if we can help support you running Arts Award sessions or becoming a school with Artsmark status.